The new Marvin Clad Ultimate Bi-Fold Door features one of the industry's widest glass panels at 3 feet, 6 inches in a frame up to 10 feet high, letting the outdoors in with less to block the view. The door will be previewed among an extensive display of innovations and enhancements from Marvin Windows and Doors and Integrity Windows and Doors during the International Builders' Show (booth W2529) in Orlando, Jan. 10-12. 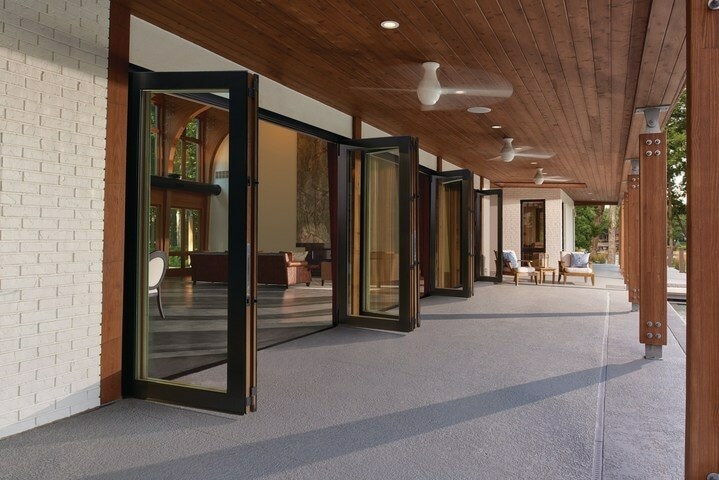 "The demand in the market continues to be for windows and doors that allow even more natural light, unobstructed views and connection to the outdoors," says Christine Marvin, director of corporate strategy for Marvin Windows and Doors. The new Ultimate Bi-Fold Door, part of the company's Scenic Door Collection, offers the beauty and durability of Marvin's signature wood-clad products. In addition to wide expanses of glass, it uses two hinges instead of three for a clean, streamlined look suitable for both contemporary and traditional designs. A concealed multi-point locking system is standard, and multiple sill liner options enable customization. A retractable screen, already well proven in the Marvin Ultimate Multi-Slide Door, is also available. Concealed within a surround when not in use, the screen is unobtrusive and is designed to operate easily with a comfortable handle pull grip and a magnetized closure for an immediate and tight seal. The door will be available for ordering in spring 2017. "Customers today are looking for bigger doors, cleaner lines and more glass, without compromising performance. We're eager to introduce a new Bi-Fold Door that delivers on all of these expectations," says Kris Hanson, senior manager, group product management. "And for builders and architects, we're pleased to provide a door that offers 45 different configurations and can span up to 55.5 feet wide for unparalleled flexibility and impressive aesthetics." In response to the contemporary design aesthetic many designers and homeowners prefer, Marvin will display enhancements and additions to its Contemporary Studio Collection. Notable among the enhancements is the new Matte Black hardware, a reflection-free finish that allows the lines and form of each piece – every pull, crank, lock and hinge – to stand out. Also new to the Contemporary Studio Collection are standard 9-foot door heights on its sliding and swinging patio and French, Ultimate Multi-Slide, arch top and commercial doors. The 9-foot height creates impressive line-of-sight views for today's modern design.